NAME: The name of the association shall be THE ASSOCIATION OF THE CLASS OF 1957, UNITED STATES NAVAL ACADEMY, hereafter referred to as the "ASSOCIATION". The ASSOCIATION was first chartered in the District of Columbia on March 7, 1958, and the Charter’s term is perpetual. PURPOSE: The purpose of the ASSOCIATION is to provide for the organization and administration of the Class of 1957 and to encourage participation and dedication by all members in the furtherance of projects undertaken by the ASSOCIATION. 1. Voting Membership: All persons who were members of the Class of 1957 of the United States Naval Academy at any time are members of the ASSOCIATION without election. a. Widows: Widows of members of the Class of 1957, United States Naval Academy, are non-voting Associate Members without election, unless they decline. b. Honorary Members: Any voting member of the ASSOCIATION may nominate a candidate for non-voting Honorary Membership. Nominations will be approved by a majority of the Executive Committee and ratified by the President of the ASSOCIATION. Honorary memberships will normally be restricted to those who have established a special relationship of service or fellowship with the Class. The President of the ASSOCIATION will provide Honorary Members with formal notification of election to membership. 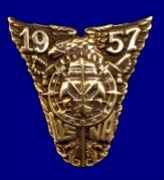 c. By virtue of their relationship with the Class of 1957 as part of the Alumni Association program “Another Link in the Chain”, members of the USNA Class of 2007 are non-voting Associate Members of the ASSOCIATION without election, unless they decline. A. The Officers of the ASSOCIATION are the President, Vice President, Secretary and Treasurer. The Officers of the Executive Committee are the Chairman, Vice Chairman, Secretary and Treasurer. B. The offices of President and Vice President shall be filled by members of the ASSOCIATION for a term of five years. The President and Vice President are eligible for reelection, but shall not serve in the same office for more than two consecutive elected terms. C. The offices of Secretary and Treasurer shall be filled by members of the ASSOCIATION who are elected to the offices of Secretary and Treasurer of the Executive Committee in accordance with the provisions of paragraph 5 below and ARTICLE VI.G. D. The Chairman and Vice Chairman of the Executive Committee of the Washington Chapter of the ASSOCIATION shall be filled by Washington Chapter members and elected in accordance with the provisions of paragraph 5 below and ARTICLE VI.G. E. Company Coordinators may be designated by the President in order to ease elected ASSOCIATION officers' span of control. These designations will be based entirely on the individual designee's willingness to serve. A. The PRESIDENT will insure that the provisions of this Charter are properly carried out. He will exercise management over all areas of ASSOCIATION activity and will have authority to disburse and invest funds. He will make annually, a report of the affairs of the ASSOCIATION to all locatable members, to include a financial statement. B. The VICE PRESIDENT will assist the President in his duties and will succeed the President in the event the President is unable to serve for any reason. He will be responsible for membership related matters, including the management of decedent affairs and dealings with Associate Members. The Vice President shall coordinate with the Secretary the maintenance of a list of deceased classmates. The Vice President shall maintain liaison with the Naval Academy History Department regarding the Class of 1957 Chair in Naval Heritage and keep members of the Association advised of the status of the Chair incumbent, curriculum vitae, and activities. C. The SECRETARY will assist the President, and the Chairman of the Executive Committee, in the secretarial duties of that office and be responsible for the maintenance of a complete and updated list of the membership of the ASSOCIATION and shall coordinate with the Vice President in maintaining a current list of deceased classmates. The Secretary will retain the official Charter of the ASSOCIATION. The Secretary may be assisted by a Corresponding Secretary who coordinates input to the Class column of Shipmate. The Secretary may also be assisted by a Webmaster, who shall maintain the Class Web Site, and by a Communications Assistant who shall maintain a list of Classmates for electronic promulgation of information of current interest. These three assistant positions are voluntary. The Secretary will be second in line of succession to the President. D. The TREASURER will assist the President, and the Chairman of the Executive Committee, in the supervision of the ASSOCIATION funds. He will be responsible for the accounting of all ASSOCIATION funds, advise the President on the management of ASSOCIATION assets, and will make an annual written report of audit (as of 31 December, yearly) to the President by no later than 31 March of the following year. The Treasurer will be the third in line of succession to the Presidency. E. The Chairman of the Executive Committee is responsible for the routine management of the Washington Chapter of the ASSOCIATION and for providing administrative support to ASSOCIATION officers in their execution of ASSOCIATION business. F. The Chairman or designated member of the Executive Committee shall maintain liaison with the Company of Midshipmen that the ASSOCIATION sponsors. Provide support as deemed appropriate and coordinate activities with the Company such as post-game tailgate picnics, class luncheons and other activities that arise. G. Company Coordinators will serve on a voluntary basis. They will assist ASSOCIATION officers as requested to facilitate communications, surveys and other tasks associated with Class administration. They will endeavor to maintain contact with their individual company-mates and advise the Class Secretary of changes to the locating information for members as may occur. Additionally, Company Coordinators will be requested to act as points-of-contact for deceased members' next of kin, particularly in facilitating communications between those next of kin and the Alumni Association (obits@usna.com). H. Assigned responsibilities and duties may be delegated to other members as circumstances dictate. In the event the President is unable to serve, his succession shall be as provided for in Article IV Section 2. Should the Vice President be unable to serve for any reason, the President shall appoint a successor to serve in his stead for the remainder of his term. The succession of any officer other than the President or Vice President shall be as provided for in Article VI.G. A. There shall be a permanently established Washington Chapter of the ASSOCIATION, which will consist of all Members, Associate Members, and Honorary Members residing or employed within 50 miles of Washington, D.C. Any Members, Associate Members and Honorary Members residing outside the aforementioned boundary of the Washington Chapter may also become members of the Washington Chapter by informing the Chairman of the Executive Committee of their intent. B. Members residing outside the boundary of the Washington Chapter may establish other Chapters of the ASSOCIATION as they desire, and establish local rules for governance which are consistent with this Charter for the ASSOCIATION. The Washington Chapter shall elect an Executive Committee to provide required management and administrative support functions. The Executive Committee shall consist of a Chairman, Vice Chairman, Secretary, Treasurer, and three committee members, all members of the Washington Chapter. (4) appointing a member of the Washington Chapter to audit the ASSOCIATION's annual financial report. The Class of 1957 has formed a special relationship with the Class of 2007, since the latter's Induction Day in July 2003, in response to the Naval Academy Alumni Association's program called “Another Link in the Chain.” This program encourages each alumni Class to form attachments to a Class 50 years their junior, so as to promote sharing of experiences and values. In so doing, the Link relationship strengthens the ties that bind Academy graduates together over the generations. ASSOCIATION members participate with members of the Class of 2007 in various shared professional and social activities. 1. Authority: The assets of the ASSOCIATION shall be managed in any way the President, in coordination with the elected officers, exercising reasonable prudence, judges appropriate. The President's authority to manage and disburse funds recognizes the fundamental need of the ASSOCIATION to have ready access to certain resources to support ongoing activities. Reasonable efforts to manage surplus assets to achieve growth for future needs is likewise appropriate. Assets of the Washington Chapter and other Chapters as may be established will be managed by the Chairman of the respective Chapter in coordination with Chapter elected officers. A. Association Operating Fund: This account shall provide for expenditures associated with ASSOCIATION activities. B. Association Investment Fund: Monies construed to be in excess of near term requirements in the Operating Fund shall be invested in an appropriate manner to obtain a higher yield than short term liquid assets. C. Washington Chapter Operating Fund: This account shall normally have resources to provide for anticipated expenditures associated with Washington Chapter activities or Washington Chapter-sponsored disbursements. Net income realized from Washington Chapter activities shall be the normal source of replenishment of such resources. D. Washington Chapter Investment Fund: Monies construed by the Chairman of the Washington Chapter to be in excess of near term requirements in the operating fund may be invested in appropriate manner to obtain higher yield than short term liquid assets. E. Terminal Liquidation of Assets: At such time as the President, in consultation with ASSOCIATION Officers and the Executive Committee, decide that the ASSOCIATION has no planned or anticipated requirements for Operating or Investment funds, selective or all accounts may be closed and funds transferred to the United States Naval Academy Foundation on behalf of the United States Naval Academy, Class of 1957. A. Elections will be administered by the Executive Committee. The Executive Committee shall advise members of the Association of the schedule and procedures for the conduct of each election. The Chairman of the Executive Committee in consultation with the President shall advise members of the Association when it is no longer considered practicable to conduct elections in accordance with the provisions of this Charter due to the availability and or desire of members to serve as an elected Officer or Committee Member. At that time, alternative procedures may be prescribed. C. The President and Vice President shall be elected as the winner and runner-up in a single election. The candidate with a plurality of votes among those eligible and willing to serve shall be elected President. After this determination, the candidate with the most votes among the remaining eligible and willing candidates shall be elected Vice President. Nominations shall therefore be for the office of President only. Nominations may be made by any ASSOCIATION member, must be submitted to the Executive Committee by 1 June of the election year, and must include contact information for the nominee. D. Nominations submitted by members of the ASSOCIATION at large will be the basis of a slate of candidates prepared by the Executive Committee for the election to ASSOCIATION offices. The Executive Committee will confirm the willingness of nominated persons to serve and will conduct the election in sufficient time to complete the proceedings by 1 November of the election year. E. The election of the President and Vice President will be conducted every five years starting in 1990. F. The election of the ASSOCIATION Treasurer and Secretary will be conducted every two years in connection with the election of Executive Committee members in accordance with the provisions of Article IV Section 5 and paragraph G below. G. Members of the Executive Committee will be elected for two-year terms by the Washington Chapter. To provide for continuity, terms shall overlap so that no more than four new members are elected in any year. Officers of the Executive Committee are eligible for reelection. If a vacancy in Executive Committee Officer Membership should occur, the senior member of the Committee will appoint a successor from among the elected Committee members. The Committee member vacancy so created shall be filled by appointment from the Chapter Membership, to serve out the unexpired term. A quorum shall consist of four members of the Executive Committee. H. Newly elected officers will assume their duties as of the 1st of January following the election. 2. Petition and Referendum: Petitions for action signed by at least ten members may be submitted to the Executive Committee. The Executive Committee shall inform the ASSOCIATION Officers of the nature of all petitions. Referendum issues will be submitted to the members of the ASSOCIATION within three months of the receipt of the petition. Notices of a referendum will be disseminated to all members using current technology available to reach as many locatable members as possible, but not limited to USPS mail, electronic email, or publishing the referendum in two successive issues of Shipmate. When disseminated, a vote of the ASSOCIATION shall be conducted. A. Each voting member of the ASSOCIATION is entitled to one vote. B. Voting by proxy is prohibited. C. Voting shall be accomplished using current technology to reach as many locatable members as possible, but not limited to USPS mail or electronic email or by count at meetings of ASSOCIATION Chapters. For each class-wide election, the Secretary will advise the Executive Committee of current methodology for providing mail-in ballots to those classmates who do not receive electronic mail. The Secretary will also advise procedures for accumulating, counting and maintaining security of electronic votes. That methodology, when approved, shall be promulgated to Classmates consistent with the timeframes in ARTICLE VI.1.D. D. Votes shall be counted by at least two members of the Executive Committee, or Ad Hoc Nominating Committee. E. A referendum shall pass if it receives a simple majority of votes cast. F. Those members receiving the most votes (plurality) for a given office shall be elected. G. Voting will be closed thirty days after the election date or the postmarked mailing date of the ballots to the members of the ASSOCIATION, whichever method is used. H. Results of election/referendum voting will be published in the Shipmate column at the earliest opportunity, at which time they will become effective. Amendments to the Charter may be proposed by petition and approved by referendum as provided for in Article VI. If approved, an amendment will become effective 90 days after notice of results are published.